As most business owners who use Square Register as their cash register and credit card reader solution probably remembers, Square released its popular POS accessory called Square Stand last year that turned an iPad into a counter-mounted point of sale system. 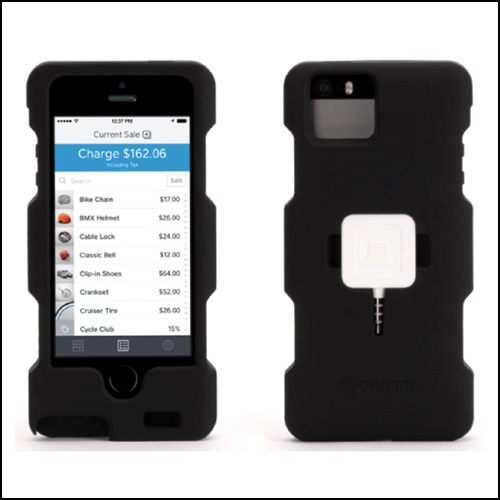 The idea was an elegant solution to a much-complained-about issue and was instantly accepted by Square users across the country. As Square reforms its iPhone app to be as versatile as Square Register is on an iPad, they have now partnered with a hardware developer named Griffin Technology to develop an iPhone case that will be the ultimate accessory for any Square user. Until this announcement, Square had not addressed the convenience issue associated with using their credit card reader with an iPhone while on the move and users were forced to simply carry the readers in their pocket or briefcase. Though there have been attempts by third-party companies to offer solutions for retailers using the iPhone such as a key chain holder for their credit card reader, Square has not released an official solution until now. This new case for the iPhone 5 will finally allow merchants to have a protective and useful shell that is specifically optimized for the Square credit card reader. In addition to the announcement about this brand new case for the iPhone 5 and 5s, Square also took this opportunity to announce a new program called “Works with Square” that will allow hardware and accessory builders to become officially recognized for their compatibility with Square’s products. Griffin Technology is obviously the first company to earn this new title, but Square expects that many more companies will be throwing their hat in the ring. It’s unclear what the actual requirements will be to become “Works with Square” certified, but more details are certain to emerge in the upcoming months. The design of the case features an ergonomic design with a reinforced area for your credit card reader to plug in so it doesn’t spin or flex when you swipe a credit card. When you are not using your credit card reader and want to put your iPhone in your pocket, you can simply unplug the reader and pop it into the convenient storage area that is molded into the back of the case. Though this design makes the case a bit thicker, the new thin design of the credit card reader minimizes this and protects it from being damaged. Currently, Griffin Technology has only designed a version for the iPhone 5 but is rumored to be working on a version for the iPad Air. At only $19.99, the case will include a credits card reader and should be available everywhere you can get the readers currently.